Why Do the Leaves Change Colors? With a 3 and 4 year old in my house, I get a preschool question about the universe on an almost daily basis. And more often than not, their insatiable curiosity about the world around them, leaves me just as curious about the answer as they are. This week, as the leaves have started to yellow and fall, they asked me “Why do the leaves change color?” And since I didn’t know the answer immediately myself, I started researching and found cool science activities for children to explain the answer. Since moving to New England over a decade ago, by far, my favorite season of the year is the Fall. Over the course of September and early October, the leaves turn from varying shades of green to an array of gorgeous color – at times, it almost looks like the landscape is on fire. Vibrant oranges, deep reds, harvest golds and yellows. I have always admired the beauty of the Fall landscape, but the inquiring minds of my preschoolers wanted more than that. They wanted to know WHY the leaves change color. During the wet and warm days of Spring and Summer, a tree’s leaves are hard at work making food for the tree. The leaf cells contain chlorophyll, a chemical that absorbs sunlight and converts it to energy necessary for the leaf to convert water and carbon dioxide into tree food – starch and sugars. Chlorophyll is green, giving the leaves the green color for the warm part of the year. As Summer turns to Fall, the days get shorter and the nights get cooler, trees stop their food making process. The chlorophyll breaks down, and the leaves green color disappears with it. The yellows, oranges and browns you now see were actually always there, but hidden under the more vibrant green. As the Fall season continues, additional chemical changes may occur, producing more of the red and bright oranges you see in some trees. Chromatography is a scientific process that separates a mixture into its parts using a solvent and filter paper. For leaf chromatography, you can separate the different components of the leaf that give it different colors by putting it in a solvent (rubbing alcohol) and filtering it with chromatography, or filter, paper (or coffee filters). The different leaf components move at different speeds through the filter, causing them to separate, leaving behind lines of different color on the filter paper. My girls have become huge fans of the Learning Resources science lab supplies – they look like professional lab supplies, but they are larger for little hands and made of plastic, not glass, for safety. Ever since reading the latest book from Andrea Beatty, Ada Twist, Scientist , all they want to do is ‘play scientist’ – which of course I can’t help but encourage! They LOVE the “science jars”, aka test tubes, and took turns wearing the safety goggles when adding the rubbing alcohol to our experiment. Confession. We tried this using several different methods to create our solution, and this by far produced the best outcome for us. The process was faster, and the results were visibly evident to the naked eye in real time – the ideal combination for science activities for children, especially preschoolers! The girls could watch the colors separate with their own eyes over the course of a few minutes, with final results evident after an hour or two. First, head outside and collect an assortment of leaves. Pick up leaves from the ground in various stages of color change. You can even pluck a few from trees too. Try to collect pairs of leaves from the same trees at different stages of color change if you can for comparison. Bring them inside to your lab table. Now, it’s time to prepare your science lab. Cut your filter paper into strips. The only filter paper I could find came in circles – just cut it up. You want the strips to be narrow enough to fit in your test tubes without touching the sides, and long enough to reach the solution at the bottom. We connected two strips together using a glue dot . Next, place your leaf at the bottom of you filter paper strip. Cover it with another piece of filter paper, and applying firm pressure, rub over it with a quarter until you see color from the leaf transfer to your filter paper. This was a great fine motor challenge for my little scientists! Then, add 1-2 eye droppers full of rubbing alcohol to your test tube. (Another fine motor skill challenge and one of the girls’ favorite parts!) Have children wear safety goggles while using the alcohol – safety first! I also recommend pouring just a small amount of alcohol in a separate container from the large bottle for them to use. Now, wrap the top edge of your filter paper strip around the center of a toothpick. Then, hang your strip into your test tube. You want the bottom of the strip to just touch the alcohol at the bottom of the tube, while the toothpick rests across the top. Try not to let the strip cling to the side of the test tube. Finally, watch the magic happen as the filter strip absorbs the alcohol and passes it through your leaf rubbing. The components in the leaf rubbing will separate into different bands of color overtime. The green oak leaf separated into brown and green. The red leaf separated into red, pink and orange. Watch the time-lapse video below to see what happens! Andrea Beatty is a favorite around our house. Her earlier books, Rosie Revere, Engineer and Iggy Peck, Architect , were awesome inspiration for our Architecture and Engineer for Preschoolers series, and Ada Twist, Scientist is definitely fueling a passion of science experiments (and we’ve only had it a week!). It also inspired this great Printable Science Journal for Kids from Sunny Day Family. We used it to document our leaf chromatography lab! And don’t miss this super cool Magic Color Changing Lemonade (and giveaway for an autographed copy of Ada Twist!) from Left Brain Craft Brain. For more awesome Preschool Science Books, check out this list from Growing Book by Book. Want more awesome STEAM Activities for Kids? 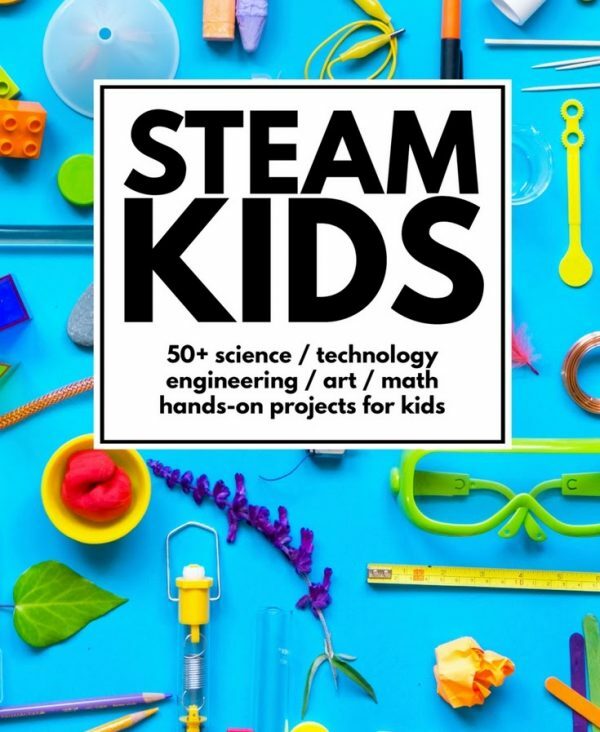 Check out the latest ebook from the Kid Blogger Network – STEAM Kids! Featuring a year’s worth of science, technology, engineering, art and math activities for children ages 3-10. Learn more in the Playground Parkbench store. The inquisitiveness of young children never ceases to amaze me. Stay tuned for more simple science activities for children to answer my kids Pre-K Questions About the Universe. Check out the first edition: What Makes Night?, part of our Studying the Stars series. You can find all of these (and so many more), on our STEM for Kids – Science board on Pinterest.